By 1973 the Women’s Liberation Movement (WLM) in Britain had mobilised thousands of women to challenge sexism in their everyday lives. Many local groups emerged to support an ever-growing social movement. Bristol was no different. Women were involved in setting up women’s centres, publishing their own media such as newsletters and the local Bristol WLM journal, ‘Enough,’ as well as finding new ways to spread the message of Women’s Liberation. Sistershow was part of this. 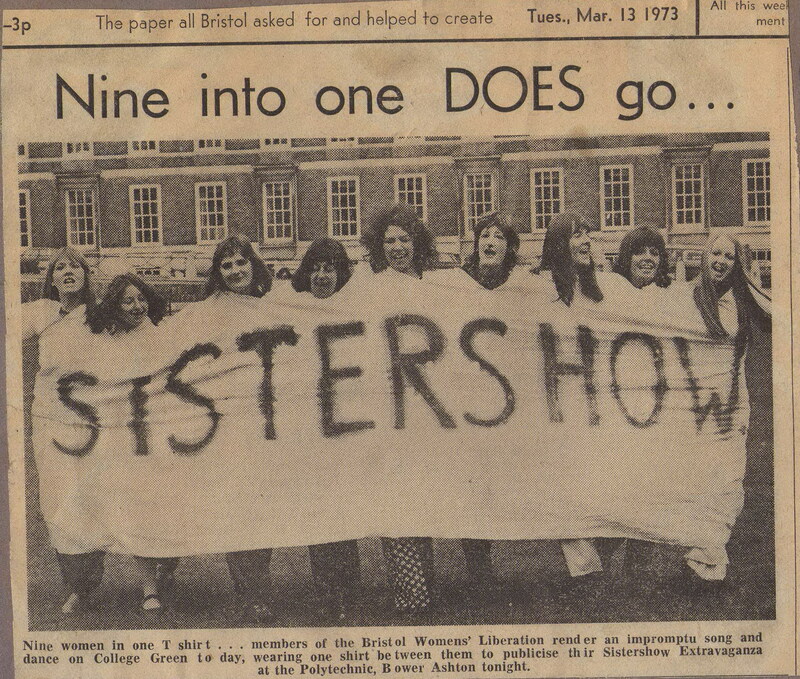 Sistershow was the amateur feminist theatre branch of the Bristol WLM. They used humour, dramatics and art to explore the feminist issues of the time. They challenged stereotypes about the humour-less feminist whilst exploring new forms of gender and sexual identities. In May 2011 an exhibition (funded by the Heritage Lottery Fund) about Sistershow and the history of the Bristol WLM (1973-1974) is being held in Bristol. The exhibtion aims to invoke the spirit of Sistershow for contemporary audiences. It will include participatory educational activities that will enable visitors to reflect upon the gender and sexual politics of the 1970s, as well as our own era. To accompany the exhibition there will be also be a catalogue which will include the research generated by the project, commentary and analysis. Another main output from the project is this blog, the online focal point for information about Sistershow Revisited. It will contain treasures we have gathered from our trips to archives, excerpts of oral interviews, photographs, practical information about meetings and community history resources.